If you’ve visited a podiatrist or a foot specialist for diagnosis and treatment of a foot problem, and have since noticed that your symptoms or ailments have reoccurred, you may be a great candidate for reconstructive foot surgery. The non-invasive treatments that were provided by your previous podiatrist may not have been effective, or you may have opted for foot surgery and found that your symptoms later returned. A podiatrist specializing in reconstructive foot surgery near Sugar Land will be able to offer you some relief. Many common foot ailments can be treated with non-invasive methods, and that is likely where any podiatrist will begin his treatment. Plantar fasciitis, ingrown toenails, heel spurs, hammertoes, ganglion cysts, and bunions can all be treated non-surgically. If non-surgical options fail and symptoms persist, your podiatrist may recommend that your condition be treated through surgery. While surgery is often a last resort in treatment, it is typically the most effective way to treat these conditions. 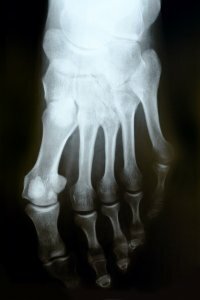 Despite surgery, some foot problems can reoccur years later. Ganglion cysts and bunions can both return even after a seemingly successful foot surgery. Additionally, surgeons are not infallible, and you may find that the foot surgeon you previously visited did not perform the surgery perfectly, resulting in complications or problems. Hardware such as screws or plates that were used in your surgery may become loose or need to be replaced. Certain other conditions may return or reoccur, requiring further surgery to relieve symptoms. Reconstructive foot surgery is sometimes performed as a primary treatment option for certain foot problems. If you’re suffering from intense foot and ankle pain, a deformity, or a disease that has resulted in the loss of function of your foot or ankle, your podiatrist may recommend surgery. Such foot problems include adult flatfoot syndrome, a foot or ankle fracture or break, acute stages of posterior tibial tendon dysfunction, severe neuromas, and tarsal tunnel syndrome. Reconstructive surgery gives the podiatrist the chance to reshape the foot to help a patient regain function and stability. This surgery can also reduce pain and lower the risk for other foot issues. The surgery is often accompanied by tendon repair, bone fusion, joint implantation, or soft tissue repair to ensure that the patient regains full use of the foot. If you have flat feet, you should talk to your podiatrist about surgical treatments to find out if they are the right option for you. The foot specialist will give you a thorough exam to find out the best way to correct your issues. Flat feet occur when the arch of the foot is too low while in a standing position. 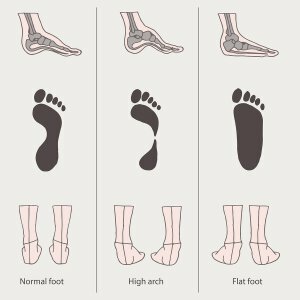 Although the foot naturally flattens somewhat when it bears weight, flat feet retain little or no arch at all, putting the entire sole of the foot into contact with the ground. Flat feet are a common cause of foot, ankle, leg, and back pain due to insufficient support of the body’s weight during standing or movement. Flat feet are not as proficient at keeping the body stable as feet that have a normal arch. As a consequence, people with flat feet are at a higher risk of developing chronic muscle strain as the muscles of the body are forced to compensate for the foot’s lack of stability. While your body may be able to adapt to your foot’s lack of support during everyday activities, when you increase your activity level by even a small amount, it can cause significant pain and muscle strain. Normal feet are designed to keep the entire lower body in the proper configuration when you stand or walk. Flat feet do not provide the same foundation for healthy posture. As the foot collapses toward the ground, the lower legs tend to rotate inward. This inward rotation can affect the entire leg, including the hips, leading to long-term leg and back pain . Flat feet are a common cause of general musculoskeletal pain and problems. Your body’s balance begins in the feet; when the feet do not provide proper support, it can raise your risk for joint problems caused by poor posture and unnatural gait. Individuals with flat feet could be more likely to experience injury or pain in the feet, ankles, knees, or hips. Treatment options for flat feet range from custom orthotics to minimally-invasive foot surgery to correct the arch . If you’d like to learn more about the diagnosis and treatment of flat feet , contact your Sugar Land podiatrist by calling Advanced Foot & Ankle Specialists at (832) 532-1197 or filling out our convenient web contact form.